The first couple weeks we really didn't notice because it was August and school was out. But last Thursday, that all changed. 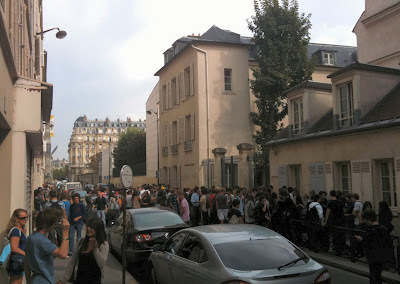 Suddenly, we noticed what seemed like hundreds of students milling around the street. Finally, yesterday I asked some of them why they weren't in class. One student in particular seemed interested in chatting. Apparently, this school (all schools?) has classes from 8a-6p (Mon, Tue, Thu, Fri) and 8a-12p (Wed, Sat) with three breaks: 15 minutes at 10a and 3p and 90 minutes for lunch. Well, lunch doesn't take 90 minutes so they just hang out in the street. There's really no place else to go. Needless to say, the street isn't as clean as it was in August. Sometimes they are blocking the entrance from the street into our apartment courtyard. Most seem to smoke. They also greet each other with a french kiss.